It’s October 1598, and the boys are back in town. Away they’ve been, touring the counties outside of London, stopping for the night in courtyards and inns, putting on plays, while the capital has slumbered and dreamt through the midsummer months, and her roustabout theatres, by the order of Mr Tylney, have remained closed for the duration, for fear of plague and riot. Don’t think they’ve had it easy, our motley crew of troubadours: They run the risk of falling foul of the Rogues and Vagabonds Act, introduced in 1572 and reinforced by Mr Secretary Cecil the previous year. More than once they’ve been run out of town, or had to do a midnight flit, despite the protections offered by their Patron, the Lord Chamberlain himself. But now they’re back on their home turf, the alleys and the inns of Southwark, holding them snug as a glove, nestled among the thieves, the cutpurses, the bawds and the whores, the beggarmen and mendicants, the quacks and the charlatans, the artisans and charmers who throng the city on the wrong side of London Bridge, and bring it alive with invention. Let’s get closer: We’re swooping past a tarred and piked head held aloft the guardhouse on this end of the bridge, gliding down the fetid, rutted road that will one day become Borough High Street, and we follow a cart into a yard, where we find galleries opening onto a cobbled surface, then through the door into the George and Dragon, and here they are all gathered - Burbage, the boss, Alleyne, Condell and Heminges, the man of infinite jest, Will Kemp, Bill Sly - and, of course, the man himself: Our Will, Master Shakespeare. He’s carrying a sheaf of papers, covered in his fine, cobwebby handwriting replete with crossings-out, amendments, ink blots and potstains. He stands up. Look at that: it’s new, freshly scripted. None but his eyes have seen it. It’s never been performed before, never spoken, never uttered, never watched, never applauded. There is a moment of near silence, almost reverence, as the script is passed out and around. ‘What’s this then, Will?’ asks one of the gang. He pauses a moment, then sniggers at his own gag. On they go, stopping, pausing, laughing, questioning. Even Burbage chimes in, although he’s busy, poring over the building plans for his new theatre, due to be constructed next year - a place to be called The Globe. Will, of course, already knows the story, although he’ll have to make some changes, and he listens quietly to his buddies riff through the lines. He idly, absentmindedly, tosses a small bundle of twine he’s fished out of his pocket up and down through the air, up and down, up and down, until one end comes loose and flails outward and upward, and suddenly it becomes a thread through the labyrinth of time. 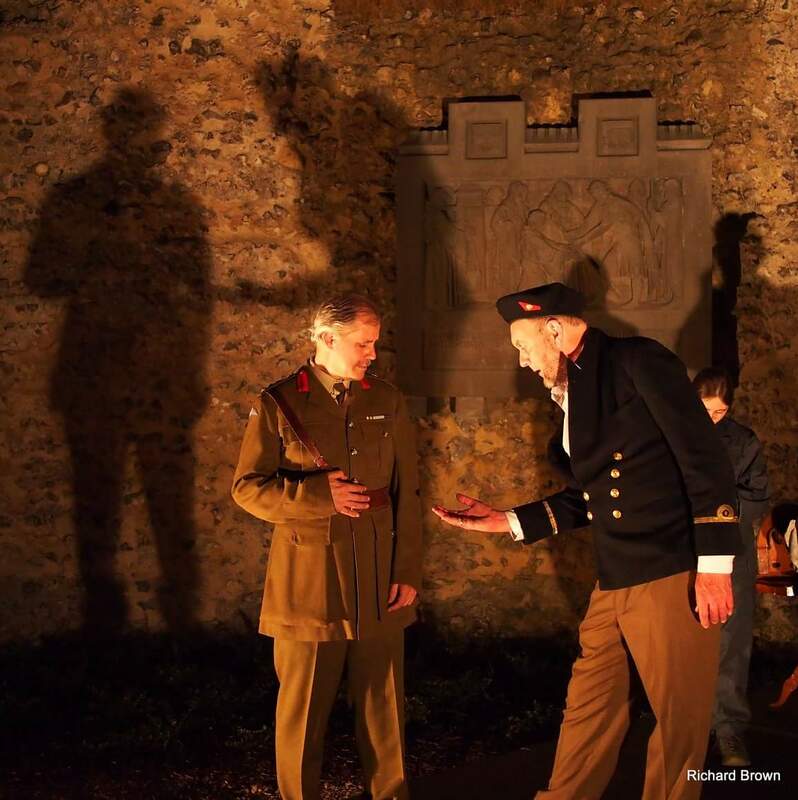 Hold on to it, and we see the story of Much Ado being performed again and again down the years, a thousand Beatrices and Benedicks, a million Dogberys, a myriad of places and performances and crowds, again and again. The twine reaches an end, and here we find ourselves, today. Going right back to that very first moment Shakespeare handed over his bright new creation, each production of Much Ado - or, indeed, any play - begins when a group of people gather, open the script and begin their examination of it - that’s when the story unfolds, and each person brings their own experience, ideas and energy to the part they must play, contributing to the tale of the play itself. All theatre is an act of collaboration, not merely through space, but also through time. Follow that smallest twine, and you realise that you’re collaborating and communing with that little Southwark band four hundred and twenty years ago - and with Our Will himself. And here we are, part of that fine thread, in the middle of a blazing summer, our stage set in a magical space, ready to breathe life once more into the tale we must tell. On with the motley, lads and lasses: We’ve a play to show.